Sei He Ki is a very different symbol. When you first look at it the form on the right shows the shape of a woman’s breasts. The form on the left appears somewhat phallic. They balance in a nurturing symbol of emotional cleansing, nurturance, and generosity. The common definition of Sei He Ki is “Divinity and Humanity coming together.” This symbol cradles humanity within the arms of the imminent Divine to nurse gratefully from the milk of the Their abundance. The food we take in is grown on her body. The waters we drink are the life-giving blood of her veins. The air we breath is from his mouth and the sun that warms us radiates from his skin. And all are shared in Love. 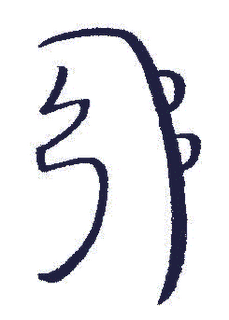 This symbol, Sei He Ki, brings humanity and divinity together in the understanding that we are One and that we only heal when we connect to the primal elemental forces in ourselves. We were made of the same elements as our Parents and when we are in harmony with their heartbeat we have far more resources with which to draw forward vitality, joy, and love. Sei He Ki is the symbol most aligned with the emotional and mental components of healing. It is virtually impossible to separate the mind and emotion. Although we have philosophical and societal constructs that attempt to do this: “boys are logical; girls are emotional” or “follow your head, not your heart” (or the inverse) it appears to be physiologically impossible to do so. Whenever we have a thought of any kind our body emits a correspondent neurotransmitter. If I have a stress thought my body emits cortisol, which means “fight or flight.”. If I have a peaceful thought my body emits natural opiates, which means “all is well.” So everything we think causes our body to create a response that shifts our physiological emotional soup and we are constantly programming ourselves to the natural high of Love or the discordant fear states familiar to far too many these days. We are ultimately emotional beings. Our drives, desires, instincts, fears, and even our thoughts must run through our emotional selves. No matter how well thought out an argument is if it doesn’t “feel” right we will ultimately find a way to reject it. Any disorder: physical, emotional, or spiritual, inevitably has an emotional component. We respond to ingrained emotional patterns. If one has repressed or out of control emotions they will show themselves in the physical as disorder of the body or mind or in the evidence of an unhappy life. The physical body is not running on a different system than the emotional body. They are the same system, which is the physical manifestation of our thoughts, emotions, soul processes, parallel incarnations, and all the varied postural shifts made in this lifetime. When we are ill we have certain emotion-thoughts about our illness that affect the illness. And when we have certain emotion-thoughts we are brilliantly capable of reinforcing or mitigating illness in our bodies and lives. Sei He Ki kindly (and gently) holds a space so that we can see where we are reinforcing our disorder and then opens up the tools for us to begin the deep healing of reversing the ingrained emotional patterns and balancing our personal light. Sei He Ki also connects us to our emotions long enough to feel them. Emotionality is too often thought of as weakness and it can be frightening to feel vulnerable in a wash of emotions that can seem overwhelming. And yet we are incomplete and disordered beings if we are not aware of the rich emotional life within. And so when we feel disconnected to what we really feel about something or someone Sei He Ki can help us to separate the noise of other people’s expectations to feel our own presence. Sei He Ki is nearly always used when a guest has an emotional release within a session. This happens more often that one might imagine. Most often the guest will be more puzzled at the sudden laughter or tears than the practitioner. The flood of Universal Light and acceptance allows old, buried emotions to break through in a wave of oceanic movement. It is best to check in gently and move on, acknowledging the event without breaking the flow of healing. The cold, frozen light of any kind of abuse is warmed enough to heal under the gentle touch of Sei He Ki. If you are working with a person who has undergone abuse Sei He Ki will inevitably make its presence known. Those who have been abused most often have undergone a loss of trust. And while that trust may ostensibly be broken with the abuser it is often extended to the spiritual realm that “allowed” it to take place in the first place. If the person has a theistic concept of God they may blame Him (or Her) for allowing the pain. Even if this blame is latent it is often there. When Sei He Ki wraps its loving arms around the wounded child healing becomes possible. Many abused individuals search for and even manufacture all the ways they are culpable and therefore responsible for the abuse. This offers a surface order to the inexplicable that allows them to hold onto the delusion of control: “If I caused the abuse in the first place, I can prevent it in the future.” Sei He Ki acknowledges the tragedy of the abuse suffered, allows the victim to forgive herself, and opens a door for possible eventual understanding and forgiveness of the abuser. Abuse happens to people of both genders, all ages, and any lifestyle. Do not be surprised when it comes to light in the context of healing sessions. It is wise to educate yourself about various forms of abuse and multiple resources for treatment. It is challenging but absolutely necessary to stay out of judgment as a guest’s story unfolds. It is easy to become indignant on his behalf and to enter a state of judgment. That’s not our job and indicates our shadow rising. We do not know the story of the abuser nor how they were originally wounded. While some behaviors are never acceptable it is never our place to stand in judgment. Moreover our guests must feel safe and part of holding a safe space for them is holding an unconditionally loving space for all, including those who have done what may seem unforgivable. Not an easy task but one to which we must all aspire. We are healers, not arbitrators of Divine judgment. Because of Sei He Ki’s talent for healing displaced and shadowed emotions it is often employed in rites of purification. As empathic, watery beings many of us absorb the emotions of those around us. We were created in the merging of the sexual fluids of our parents and are born from the emotional embryonic fluid of our mothers. We are emotion slowed down enough to form. And as emotional beings we fundamentally communicate in emotional ways. When we interact with others it is often through waves of shared feeling. Often we speak of “feeling” someone. Of “getting someone.” Of really “seeing” someone. This is rarely meant in a logical, intellectual way but more as a fundamental knowing of the other’s essential self. And since we interact on essentially emotional terms we may find ourselves absorbing the emotional realities of those around us. This absorption can be a syndrome filled with inherent distress when left to run wild or a gift of connection when artfully employed. Sei He Ki assists us to purify our own waters that we are not so saturated with the emotions of others that we become lost in the waters of those who surround us. Sei He Ki as purifier also serves as exorcist. Demons are the tossed aside and submerged “problem children” of humanity. When a person refuses to look at the shadow parts of himself he hides them and they take on lives of their own. These demons feel separate, discarded, and free to act in whatever deranged way they wish. Sei He Ki recognizes the demons of humanity as lost and frightened emotions that need purification, which it willingly offers along with the option for the discarded shadow being to return to the whole for healing and reintegration. Because Sei He Ki is working so much with the fluid realms of Light in which our emotion-thoughts take shape to create our perceptions it is most aligned with liquid light state. It teaches us to shift ourselves into the form most agreeable to healing our inner waters.